Not many people enjoy being cold, I certainly don’t! Luckily there are many heaters available to warm up our homes and make us feel comfortable and cozy during the cooler months. If you are planning to buy a heater this winter, don’t forget to pay attention to the following this tip! Did you know there is more than one type of heating? 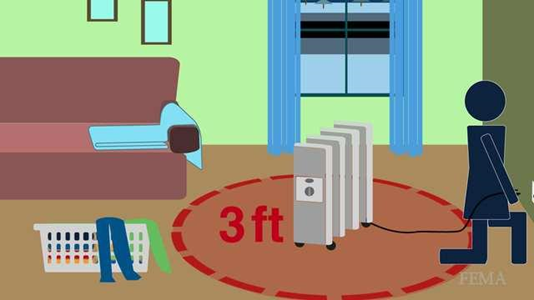 Before choosing a heater, identify the type of heating that is suitable for your room. Usually, there are two types of heating which are infrared heating and conventional heating. Convection heating is the most commonplace kind of room heating. Convection heaters are recognized for their capacity to heat the whole room successfully and for a longer time. A convection heater circulates convection currents across a heating element in order to create an overall warm temperature for your room. Many convection heaters also include fans (referred to as fan-forced), to circulate warm air throughout the room. Infrared heating uses infrared waves to heat the area. The heat radiation produced is felt when we are in the area affected by the wave. Infrared heaters function just like the sun by emitting infrared light, which we cannot see with our eyes, the light is absorbed by our body and the other items inside the room. To produce the infrared light, they use a series of coils and a reflector to direct the light outward. The absorption of this light warms your body. 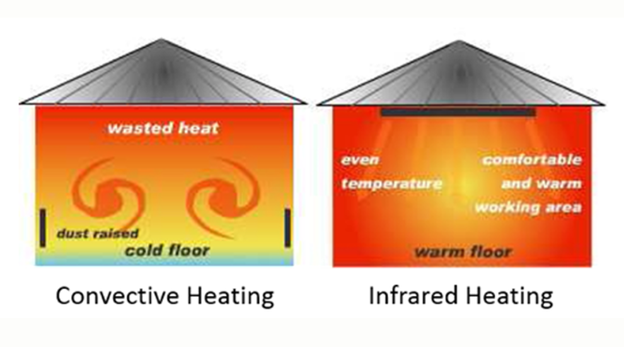 Infrared heating is more efficient and environmentally friendly than using conventional room heaters. Why is that? It is because convection heating warms the air around the heater steadily spreading out to heat the room but often it takes a long time or if it is a small heater and a large room it just can’t do the job. In infrared heater is not designed to heat the room it simply heats you as you sit near it. Indoor types include baseboard electric powered heaters, sometimes called low-profile heaters, are usually located alongside an outdoor wall in a room, they can be fixed permanently in place. They offer consistent warmth, low-price set up and quiet operation, and are an excellent heating option for basements and rec rooms. Tower heaters are electric heaters in a tall case. They give directional warmth and are perfect for lounge rooms areas, sunrooms and more or less any room that can be closed off. Radiator electric heaters are best for long durations of heating time and offer even, consistent and much less drying heat than radiant and fan-forced heaters. Radiator heaters are a perfect choice for heating bedrooms. Most models have wheels so that you can move them from room to room. Panel heaters are quiet, light-weight, and most can be installed on a wall. Panel heaters do not glow orange, and their contemporary design complements room décor. They are generally placed in large areas like lounge rooms. 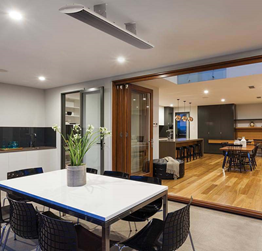 Outdoor heaters are very popular in Australia where everyone loves to spend time outside year-round and often prefer to entertain outdoors having friends over for the popular Aussie bbq and outdoor dining experiences. 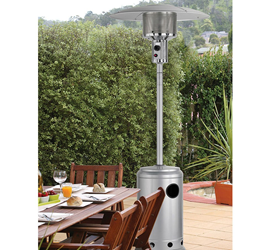 Patio heaters can be electric powered or gas. Electric heaters are commonly wall-mounted heat lamps that offer directional warmth over outside baths or dining regions. Gas models produce heat for up to a 20-foot diameter vicinity they use kerosene, propane or natural gas with umbrella-like designs on poles 7 ft or higher. Tabletop heaters look like table lamps and may be used indoors or outside. Offered in as gas or electric powered units, they are an excellent option for decks and patios. To update your household heating click here to Shop Heaters Australia. Think about the type of space you will be needing to heat the most, where does your family spend their time. If you want to heat a large lounge area with lots of furniture in it for most of the day and/or evening, then probably a convection room heater will be best. This heating will spread warmth throughout the room. Alternatively, if you live alone and can just have a small heater placed in front of you then infrared heating is most certainly a better option. Another thing to think about is power usage. Both convection and infrared room warmers use the same electrical power. But if calculated in detail, infrared heaters tend to be more economical. Infrared heating will immediately provide a warm effect as soon as it is turned on, in contrast to convection room heaters which require a decent amount of waiting to feel the warm effect once turned on. Like most electronic equipment, many heaters have a level of noise during operation. Therefore, this is something that you should think about before purchasing. If you don’t like noise, it is better not to choose a fan forced heater because the propeller of the fan can make noise. Choose an efficient heater which matches your budget. Sometimes there can be hidden costs, for example, a cheaper heater may end up more expensive once you factor in efficiency, power usage and replacement as it is more likely to break sooner. Generally, well-known brands are quite strong and durable and are more likely to last several years, additionally many higher quality heaters in Australia and New Zealand will have an energy star rating so you know how much power they will use. Also, check if the brand provides warranty and after-sales service. It is important to note that heaters can be very dangerous. Ensure you always have a working smoke alarm in every room and well as insurance for your home in case there is a fire. Other safety considerations include keeping a fire blanket and/or fire extinguisher in an accessible place in the house. Also ensure that when a heater is in operation, particularly a gas operated one that it is properly monitored at all times and that nothing is placed on or too close to the heater. Good luck with your heater purchase and may you choose the ideal one to keep you cozy for many winters to come!